What worked is a plastic milk bottle placed underneath our kitchen sink to catch grey water. The grey water's existing plastic tube was cutoff and placed into the opening of that bottle. We have to keep an eye on the bottle to make sure it does not overflow. This make-do works well enough! When my memory goes to that fateful day, I see those horrendous images in my mind's eye. It must be the same for you? 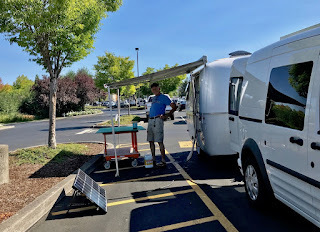 We are at The Home Depot to work on Tránsito's solar panel rack. We bought a piece of 1/2" plywood sheet, cut to size. Also, wood preservative. The plywood sheet shall be the base of the solar rack. We setup a work shop for applying the wood preservative. In these modern times, it seems to me, that there is a ton of details to get by in order to accomplish almost everything. It may seem kinda straight forward to do these things. But often, it's not! The backup to iCloud was taking too long. So, I used iTunes to prepare a backup. But I had to use Google to find out how. The SIM card is easy to remove. In fact, it usually falls out! For my fingers and eyes, inserting the SIM card is not easy!! It took me several tries to do the restoring. Apple did not like my password for awhile. But finally, Old Apple conceded that I actually did know my own password! Hallelujah! Anyway, the point of this 6:24pm Blog post is that it takes a ton of stuff to do things nowadays. It's not like the old days when the goose neck phone that sat on its own table in our hallway had only four numbers. When I go out to eat supper, as I did tonite, I enjoy taking my Mac with me and viewing the PBS News Hour. The speed of downloaded videos is much faster with T-Mobile than it was with Verizon. In fact, I would now be comfortable saying about Verizon that their claims about speed are really simply hype. Sounds like a big outfit to me too! Before I got my Scamp, I never heard about them. Back in the 40's and 50's when I wa a kid we camped a lot! Camping back in the pre-self contained RV days meant a tent in a campground. Dishes were washed in a plastic basin and the contents were then disposed of by either 1) throwing it on the gravel road to keep the dust down or 2) dumping it under a convenient tree. Those were the options. Boys and dad did #1 behind the same tree, same as all the deer, bears, moose, elk, etc. (who actually did #2 there as well but don't tell anyone). Human's #2 usually took place in an "outhouse" which was a 4-5 foot hole in the ground surrounded by a small smelly wooden structure. I can not remember ever seeing a pump out truck, these pits were just left to maintain themselves with the odd scoop of lime tossed in by a Ranger. Personal washing was done under the communal faucet or water pump with a bar of Lifebuoy soap which was allowed to drain away into the surrounding gravel. I remember the National Parks being just as full then as they are now. Back then this activity was called "camping". Now it is called "committing irreversible environmental damage". Go figure. I know this does not apply when Stealth Camping. Then efforts must be made to reduce our "footprint" and George has come up with yet another great idea! Great to read about your: Way-back-then times!